Baked beans are one of the best things humans can eat. Research done in the USA found that the nutrients found in many vegetables, fruits and red wine are also found in the skin of beans. Those people who laughed at Alan Shearer when he revealed his secret to scoring was a dish of chicken and beans should hold their hands up and apologise. The reason beans are so healthy is that they contain antioxidants which protect the cells in our body. In recent years, we have learnt that antioxidants protect us from the effects of aging and all sorts of diseases such as cancer and heart disease. This means that beans are one of the best forms of nutrition available for humans. It doesn't mean you should begin a diet of baked beans on toast for the rest of your life. But you should aim to have them at least once a week. Australian cricketer Shane Warne is a huge fan of baked beans and admits they play a key part in his diet before a game. 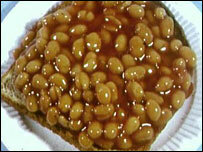 Try not to limit yourself to baked beans alone - all beans are good for us. Not only are they low in fat, they are also full of protein and fibre. They also provide important vitamins and minerals, including iron, folic acid, zinc and potassium. So, next time you turn your nose up at baked beans on toast or the runner beans on your plate - think again - they could add a couple of years to your life!